What a blessed year 2013 was – not because of anything wonderful or terrible – just because of God’s grace to our family. Everyone seems to have grown so much in the last year. Eric’s faithfulness in prayer has increased. He’s been amazed at God’s consistent work through his humble prayers. I finished my goal of blogging through the Bible. I still can’t believe I was able to write 365 straight posts. You can read what I learned from the endeavor here. Canon (11) just grew. Man, he’s big. Anne (9) has shown immense improvement – both physically and mentally. 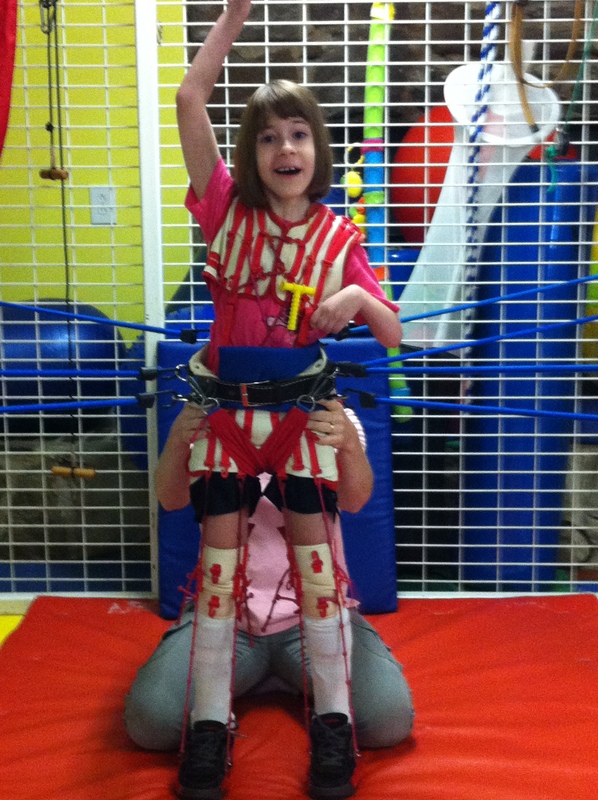 Her seizures are under control, she can walk with a walker and she is able to focus for longer periods of time. Kate (7) has grown up in every way. She’s responsible and kind-hearted. I’m so thankful for God’s work in Kate this year. God is always faithful to work in all of us! We are most thankful for 2013 and look forward to God’s adventures for 2014! Okay… Here goes :-) Can I just say that I’m SO thankful for special ed. services in this county???!!!! Anne’s teachers, case managers, therapists, assistants…. are all amazing and want what is best for Anne. Anne receives absolute top-notch services in a wonderfully nurturing environment. We are so thankful for Anne’s school and the people who work there. My meeting at Anne’s school went GREAT! Her teacher had nothing but positive things to say about Anne… “She’s no more disruptive than some of the 5 year old boys we have in class.” Everyone seems to have compassion for Anne, and they all genuinely want to help her. All of their recommendations were spot-on. I could not be more pleased. Academically she’s right on track with her class – and maybe just a little bit ahead in Language Arts. The fact that she has her short-term memory and can learn/retain new information is a miracle. She is loving school – just loving it. On a different note, Anne is having seizures again – very different than the ones from last winter. Please pray that we would find the right combination of medication(s) to help control the seizures. THANK YOU for all your prayers. I think this is the beginning of a fantastic school year for Anne!!! She still stutters, but I noticed a significant drop over the weekend when she was able to get more rest. Her speech therapist thinks we should take the “wait and see” approach. Typically stuttering in children takes care of itself without any therapeutic intervention. I’m praying that’s the case for Anne! We’re so grateful for your prayers. It’s a constant source of encouragement for our whole family! Anne is still having seizures. She actually had a video EEG a few weeks ago. She had a seizure during that time, which was great from a diagnostic perspective. She is having mild clonic-atonic seizures which originate from her left temporal lobe and both frontal lobes. They are considered mild because she remains conscious and lucid throughout the seizure. She is on her 2nd medication. The first did nothing but make her tired – it had no affect on her seizures. Most of the time, her seizures are mild and don’t last very long – but every now and then, she’ll have an intense one that lasts too long for comfort. that her stuttering would disappear. Anne’s seizures have been very inconsistent, so the fact that she had one WHILE THE DOCTOR WAS IN THE ROOM – was a miracle – and a direct answer to many prayers. The good news is that they appear to involve a small area of Anne’s brain, are relatively mild and were diagnosed early enough to prevent future damage – at least we pray that is the case! I just got home from our church’s Christmas program rehearsal. Three of us are particpating in it, so it was a busy night! Tonight’s rehearsal crystalized some thoughts for me – as I’ve been wrestling with why I’m struggling with Christmas this year. I didn’t want to put up the tree, but I did it- for the kids’ sake. I didn’t want to deal with presents or wrapping paper. I don’t like seeing all the lights. It’s all so painful – b/c it’s all tainted with grief. I think for the first time in my life, I find myself wanting to push past all of this christmas-y stuff – and find Jesus. I have this image in my mind of unwrapping this huge box that is covered with commercial christmas paraphernalia. And the box is really hard to unwrap and open – layers and layers and layers of paper and packing tape and packing material – to finally uncover the tiny Christ child – hiding in the bottom of the box. And I’ve needed comfort… I am taking Anne to the neurologist tomorrow morning b/c we think she might be having seizures. We’ve been calling them “episodes.” She’ll zone out and jerk her body slowly. They last anywhere from 30 seconds to 2 or 3 minutes and they are SO difficult to watch. It’s just a painful reminder that my sweet little girl has a serious brain injury. Will you pray for us tomorrow morning?